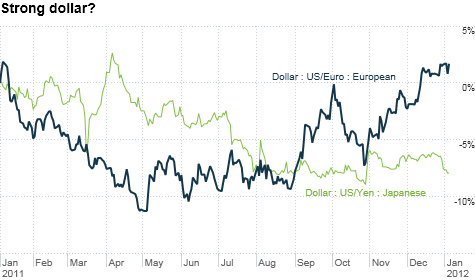 The dollar has looked good against the stumbling euro in the past year. But it's a different story compared to the yen and other global currencies. Click chart for more exchange rates. NEW YORK (CNNMoney) -- In this corner, weighing in at 45 kilograms soaking wet ... he's all the rage in Paris, Milan, Brussels and Munich! The euro! And in this corner, coming in at 100 pounds ... he's down but not out. Still the undisputed (but not undefeated) reserve currency of the world! The U.S. dollar! Let's get ready to rumble! Or not. The euro and dollar are more currency chumps than champs lately. Sure, the dollar has strengthened against the euro in recent weeks as Europe's debt crisis continues to fester. But there are many reasons to dislike both currencies. The Federal Reserve has already said that it is likely to keep its key overnight lending rate near zero until mid-2013. Low interest rates are an enemy of a currency as exchange rates tend to rise and fall with them. And it would not be a major surprise if the Fed, which just disclosed Tuesday in minutes from its latest meeting that it intends to start publishing interest rate projections with quarterly economic forecasts, extends the zero rate pledge until 2014 sometime soon. For one, the U.S. economy remains in my self-proclaimed low and slow BBQ recovery. What's more, several of the more hawkish (i.e. inflation fighters generally in favor of less stimulus) members of the Fed's policy committee are out this year and will be replaced by Fed regional presidents with more dovish leanings. That adds up to a weaker dollar, especially if the Fed announces a third round of bond purchases, or quantitative easing, to keep long-term rates low. QE3 is far from certain since some market experts and politicians have warned about an eventual inflation spike if the Fed keeps printing money to buy debt. But as long as the economy remains closer to recession than a true sustained recovery, QE3 can't be ruled out. Still, the dollar resembles Mike Tyson (back in his mid 1980s heyday as opposed to his current status as punch line to jokes in "The Hangover" movies) when compared to the euro. The euro is fittingly more like Glass Joe, the French boxer from Nintendo's Punch-Out! with a notoriously weak chin. While the U.S. has a looming debt problem, Europe is already in a full-blown crisis. And it may be impossible for the different nations in the eurozone to come up with a quick and neat solution. That's why the euro, which Wednesday morning slipped back toward the 17-month low of $1.2857 that it just hit last week, may continue to fall in the next few months. "Europe is a mess. They still don't know what they want to be. A political union? A monetary union? They need to make a decision," said Michael Woolfolk, senior currency strategist with Bank of New York Mellon. Woolfolk also noted that the European Central Bank is likely to follow the Fed's lead and cut interest rates closer to zero pretty soon. Last month, the ECB lowered rates to 1%. That was the second rate cut since Mario Draghi took over as ECB president from Jean-Claude Trichet, who was more of a stickler for fighting inflation than worrying about the debt contagion. And pricing pressures are easing in Europe. The EU's EuroStat office reported preliminary data Wednesday that showed the inflation rate for the 17 countries using the euro currency fell to 2.8% in December from 3% in November. That makes it far more likely that the ECB will cut rates to .75% at its next policy meeting on January 12. Even if the ECB doesn't cut rates next week, another strategist said it's a question of when, not if, the ECB will lower rates below 1%. "The euro should continue weakening, but it may be gradual rather than sharp," said Vassili Serebriakov, currency strategist with Wells Fargo. "The critical factor for the euro is the ECB's policy stance. Even if they don't cut rates at the next meeting, cuts are likely further down the road." Nonetheless, investors should not mistake any more gains that the greenback may make on the euro as a sign that the dollar is almighty once again. "The dollar is doing well versus the euro but it's stuck in the middle versus other major currencies," Serebriakov said, adding that countries such as New Zealand, Canada and Australia -- which are benefiting from booming commodity markets -- have currencies that are more attractive than the dollar. "Overall, it's hard to argue for broad dollar strength right now," he said. That's not good. The combination of a weak dollar and a weak euro could be a big problem for the rest of the world. Sure, the anemic euro and dollar may make the prices of European and American-made goods more attractive. But that could come at the expense of other developed market countries. Japan and Switzerland both had to take steps to rein in the strength of their currencies last year as investors fled the dollar and euro for the relative safety of the yen and franc. The fear is that countries that depend on exporting products to the likes of Europe and the U.S. will face a double dose of pain. First, their products are more expensive. Second, demand may already be weakening because of the global macroeconomic concerns. "The United States is ... much less export dependent than either Switzerland or Japan. But in these smaller economies, the currency moves have hit hard," wrote Milton Ezrati, senior economist and market strategist with money manager Lord Abbett in a report Tuesday. And that brings us back to the ECB. Ezrati argues that the only way for the euro to get out of its funk is for the ECB to do even more to support the currency. That likely means more focused purchases of bonds of the most troubled European nations like Italy and Spain. While such easing could certainly weaken the euro in the short-term, it would go a long way toward ending the crisis of confidence plaguing the continent. Ultimately, that supports a stronger euro. "The currency pressures and accompanying distortions will persist until the ECB makes a more concerted effort to relieve the immediate fears in Europe," he wrote. But here's some reason for encouragement. The new ECB chief seems to understand this. "Draghi is no Trichet. He fits in well with the G7 central banker mentality right now, which is dovish and that monetary policy needs to be extremely accommodative to support government stimulus efforts," Woolfolk said. Best of StockTwits: Yahoo (YHOO, Fortune 500) finally has a new CEO. And StockTwits users were quick to chime in on whether or not the color purple suits former PayPal head Scott Thompson. RobTheStreet: I know PayPal is a solid biz, but what makes a payment co's success likely to translate well to a media co like $YHOO? Can someone explain? It's a good question. The problem many investors have with Yahoo (as well as AOL) is that they are really slow-growth content companies trying to pass themselves off as exciting tech stocks. Does the hiring of Thompson signal that Yahoo wants to move more into e-commerce? Stay tuned. graubart Interesting choice for Yahoo, picking a former CTO, rather than a sales & marketing leader $YHOO >Maybe Ross stays on then. The Ross he's referring to is Yahoo executive vice president of the Americas region Ross Levinsohn. 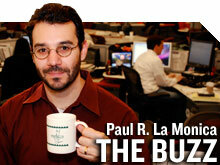 He was viewed by some as a possible in-house successor to the fired Carol Bartz. mohannadaama: So with a new CEO, best case scenario for $YHOO now is disposition of Asian assets rather than outright sale of company. Exactly. My Fortune colleague Dan Primack is reporting that Yahoo's board has told private equity suitors it's not interested in selling the entire company. And that's probably a big reason why Yahoo's stock is down nearly 2.5%. techinsidr: Can't believe that Thompson would leave Paypal for $YHOO. That's like Belichick leaving the Patriots to coach in the CFL. Ha! Yes, PayPal parent eBay (EBAY, Fortune 500) is in a stronger position than Yahoo. Time will tell if Thompson returns Yahoo to former glory or if he is another version of Tim Armstrong, who went from small fish in the big pond that is Google (GOOG, Fortune 500) to become the CEO of the less successful AOL (AOL). For what it's worth, watch me explain why I still think Google is a much better stock than Yahoo. As for Mr. Hoodie, don't you think the lack of a Grey Cup on Belichick's resume really gnaws at him? Economists a bit more optimistic about U.S.